SmartMovie is a video player for your mobile device, with counterpart PC converter utility. 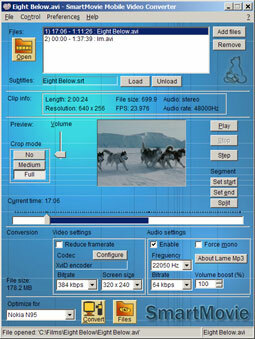 With the converter, you may prepare any video clip for Playback on your mobile device. SmartMovie play your videos on your mobile device, anywhere, anytime, you need just a few steps: Convert any video file on your PC into a phone-friendly video file; Upload video into device/memory card; Play the video in SmartMovie Player installed on your mobile device. * Fast conversion; on a standard PC conversion is 5x faster than the video clip playback time. Qweas is providing links to SmartMovie 4.15 as a courtesy, and makes no representations regarding SmartMovie or any other applications or any information related thereto. Any questions, complaints or claims regarding this application SmartMovie 4.15 must be directed to the appropriate software vendor. You may click the publisher link of SmartMovie on the top of this page to get more details about the vendor.